Aliette de Bodard: Multi-Hugo Nominee! The good news just keeps coming. Right off the heels of her Nebula nomination and being announced as a finalist for prestigious Lambda Literary Award, congratulations are once again in order for Aliette de Bodard. This time we’re thrilled to announced that Aliette has been nominated for not one, but two Hugos! We’re so pleased that her work is getting the attention it so rightly deserves! Aliette’s THE TEA MASTER AND THE DETECTIVE has been nominated for Best Novella! THE TEA MASTER AND THE DETECTIVE was published last year by Subterranean Press in the US and Canada. It’s available outside North America via JABberwocky in eBook and paperback editions. 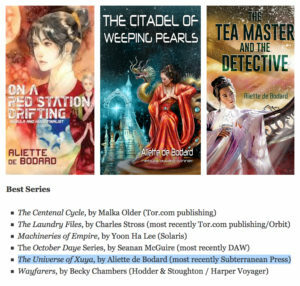 Aliette’s The Universe of Xuya has been nominated for Best Series! The latest book in the The Universe of Xuya, THE CITADEL OF WEEPING PEARLS, is available now! JABberwocky is proud to work with Aliette and many other talented writers. Their books add a wonderful depth and breadth to our agency’s in-house ebook publishing program, now with ~450 titles and growing. We’re also excited to announce that Neil Clarke had been nominated for a Hugo award for Best Editor, Short form! Neil is one of JABberwocky’s newest clients and we’re looking forward to a very bright future.